I follow the personal development movement to a certain extent. I love motivational books and recordings. If I’m going on a road trip, there’s nothing better than listening to an audio book about how to become more successful or better manage certain aspects of your life. I’ve always thought it’s a great idea to use your car as a classroom by educating yourself while you’re driving by listening to positive authors and recordings. One of the things I’ve been hearing a lot about lately is that it’s a good idea to write your own obituary. It may seem crazy at first, but if you write your own obituary, it gives you a sense of the person you want to become and the direction in which you want your life to move. With that said, I thought it would be a good idea to write my own obituary. Since I share a lot about myself in this column, I decided to share this intimate, personal and intensely private document with you, as well. And please . . . try not to cry. 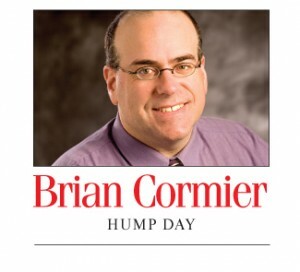 “World-renowned beloved writer Brian Cormier died today after collapsing following his record-breaking 10,000th donation to the Mensa DNA Bank, the world’s premiere source for single women wanting to bear a handsome and genius child. While Mr. Cormier did not appear to be in ill health, he was 110 years old. Mr. Cormier’s DNA was in large demand around the world. His donations are credited with fathering thousands of children, including at least three Nobel laureates and various presidents, prime ministers, Olympic medalists, Oscar winners and captains of industry. His donations were reportedly so potent that women would become pregnant simply by entering a building in which they were being stored. A trillionaire, Mr. Cormier won the largest lottery jackpot in Canada in 2011. Subsequently, he managed to parlay his winnings into investments that made him the wealthiest man in the world. In 2016, he was seen handing a wad of cash over to Bill Gates when the latter fell on hard times after Microsoft went bankrupt following its merger with Tim Hortons. When coffee was made illegal, Tim Hortons was forced to close and Mr. Gates became homeless. Mr. Cormier’s generosity was legendary. He set up various foundations around the world that funded research that helped to eradicate the common cold, eye boogers, excessive ear wax, grey nose hair and snoring. In 2026, he was awarded the Nobel Prize for medicine for finding a cure for ingrown toenails. Despite his fame and fortune, Mr. Cormier’s life was not without controversy. He was banned from showering at his local gym because of his “incredible handsomeness.” In fact, a group of wives sued Mr. Cormier in 2024 for turning their husbands gay by merely showering in their presence. The NTTAWWT (Not That There’s Anything Wrong With That) Women’s Coalition disbanded after the wives fell in love with Mr. Cormier, as well. He subsequently married them as a group after demanding that the government change federal law to allow him to do so. In fact, after having the constitution changed in 2030 so that he alone appointed the prime minister, Mr. Cormier was able to have many laws changed in the country. In addition to making university education free, he made public flogging mandatory for drivers who did not properly use merge lanes and established the death penalty for people who stood in line at a grocery store’s “eight items or less” lane with nine items or more in their cart. Many were shot on site. After winning multiple Oscars, Emmys, Tonys, Grammys and various other honours, he went on to host 12 consecutive Academy Awards broadcasts. In fact, he not only hosted the show, but swept nearly every category each time, losing only once in the Best Actress category to Meryl Streep for her eerily accurate portrayal of Miss Piggy in the Muppets biopic Kermit the Frog – The Life of a Morally Depraved Amphibian. At the age of 108, Mr. Cormier won six gold medals at the Olympic Games held in Acadie Siding, N.B. Controversy surrounded him at the Olympics, too, after he was accused of impregnating both the female and male Australian swim teams simply by sitting in the stands to watch them compete. Following a short stint as pope and president of the United States, Mr. Cormier decided to retire at his French villa (formerly known as Versailles). His term as pope will be remembered for having the traditional communion host changed to pretzels, while his term as U.S. president will be remembered for his decision to change the national anthem from The Star Spangled Banner to Bruce Springsteen’s Born in the U.S.A.
I’m glad I got that over with! Now to get down to the store for that lottery ticket.